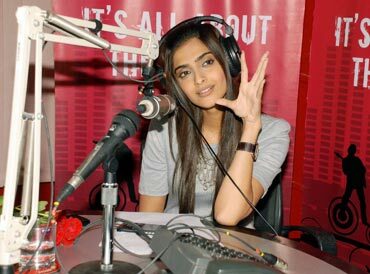 Sonam Kapoor gestures at the music launch of her upcoming movie, Aisha on Fever 104 FM, in Mumbai on Thursday. Actors Prashant Narayanan and Aruna Shields pose during the premiere of their movie Mr Singh Mrs Mehta in Mumbai. The movie releases today. 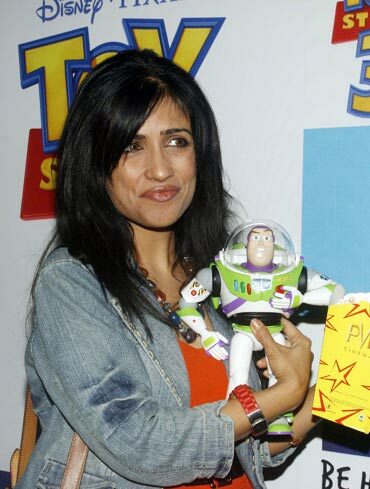 Singer Shibani Kashya poses with a Buzz toy during the launch of Toy Story 3 product range in Mumbai. The movie releases today in India.